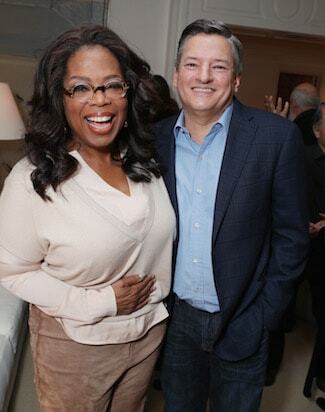 Oprah Winfrey and Ted Sarandos The cultural deity and the Netflix chief linked up at Norman Lear's house on Saturday night for a celebration of Ava DuVernay's Oscar short-listed doc "13th." 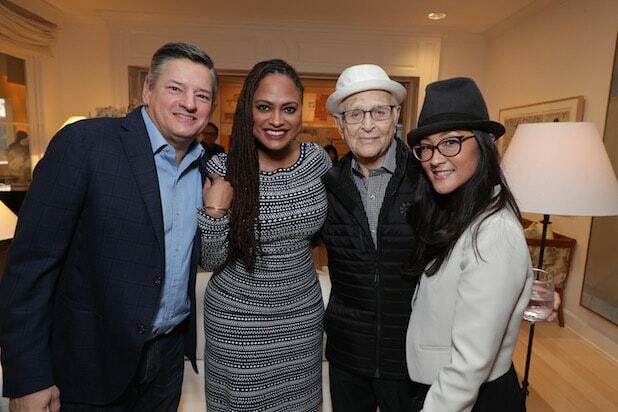 Ted Sarandos, Ava DuVernay, Norman Lear and Netflix's Lisa Nishimura Norman and Lyn Lear's living room is known as an incubator and launch pad for political documentaries and activism in Hollywood. DuVernay's film explores the history of race and the criminal justice system in the U.S. At last month's IDA Awards, Norman Lear riled up the room: "If [Donald Trump] or his administration in any way threatens the free speech rights of our documentary filmmakers, the IDA and every supporter in this room must hunker down together and fight our asses off!" The BAFTA LA Awards Season Tea Party at the Four Seasons "Stranger Things" gang Noah Schnapp (left) and Finn Wolfhard (right) recruited a new member of the team: Sunny Pawar, who played the lost little boy in "Lion." Meanwhile, Millie Bobby Brown recruited Noah Schnapp for "Mission: Ryan Gosling." People were so glad to bump into one another, it took a long time for them to actually make it into the ballroom. Thandie Newton, Edwina Findley, Ryan Michelle Bathe, Sterling K. Brown, Mahershala Ali and Tichina Arnold gathered in the foyer, which had all the action for the first hour. Michelle Williams, Thandie Newton and Naomie Harris All thee of these women are up for Golden Globes on Sunday, with Williams ("Manchester by the Sea") and Harris ("Moonlight") going head-to-head for supporting actress in a motion picutre. At BAFTA, though, it was all love. BAFTA LA Chairman Kieran Breen The crowd quieted down and listened to their host after several people tapped their champagne glasses (Actually, it was Ruffino Sparkling Wines - Italian, not British nor French). Breen highlighted BAFTA's year-round involvement in the community that goes beyond glossy events like this one. Team "Westworld": Evan Rachel Wood, Thandie Newton and Angela Sarafyan The authentic off-screen friendship between onscreen allies Newton and Sarafyan proved to be an enriching sight, with the two holding hands and guiding each other through the crowd and out of conversations with fans... with the exception of Joe Jonas. The DNCE singer and his girlfriend stopped the pair to say how much they like the show. Mahershala Ali and Ryan Gosling If forecasts are correct, you may be looking at the 2017 Oscar winners for Best Supporting and Best Lead Actors. Welsh rarebit and open-faced Coronation chicken sandwiches, anyone? This British cuisine is not on the regular Four Seasons catering menu. Harvey Weinstein, director Garth Davis and Riz Ahmed Weinstein & Co. are still actively campaigning for "Lion," even holding a screening on the Friday night of Golden Globes weekend at the IAC building in West Hollywood. A party at Estrella followed. Speaking of Riz Ahmed... He spent time with the other most lauded "defendant" on TV this year, "The People v. O.J. Simpson" star Cuba Gooding Jr., who was lifted off his feet by castmate Sterling K. Brown when the two met up on the way into the party. "Loving" star Joel Edgerton. To make it over to Lionsgate's "La La Land" party at Cecconi's, Ryan Gosling left the BAFTA event through what I call "The Leo Door": a security door in the corner of the ballroom that "The Revenant" actor has used in the past. Earlier, Film Independent President Josh Welsh, Issa Rae and Sterling K. Brown toasted the Spirit Award nominees at Boa on Sunset. Welsh also celebrated his show's streak of two years without a single Spirit Award winner reading off of a piece of paper at the show. He implored this year's nominees to leave the thank you notes at home again for 2017. Ruth Negga, Michael Shannon and Peggy Siegal Navigating fans on the Sunset Blvd. sidewalk, this trio made it to the morning event seven weeks to the day before the Spirit Awards' big bash on the beach. This thoughtful community will still let you join (and potentially attend the ceremony this year). If you have $95 and join by this Friday (Jan. 13), you can still vote on this year's Spirit Awards. Yes, you. Ava DuVernay and Craig Robinson Norman Lear would host his own soiree for DuVernay's doc "13th" later on Saturday at his home. The prime purpose of the Spirit brunch was to present three $25,000 grants to filmmakers. Here, Anna Rose Holmer goes home a winner. Piaget, American Airlines and Jeep sponsored the brunch and helped to fund those significant grants. Sterling K. Brown made the "make it rain" symbol as Rae introduced the winners. "This is real," Rae said. Former Olympian Caitlyn Jenner chatted with "Nocturnal Animals" star Armie Hammer -- who played not one but two varsity rowers in "The Social Network -- at the Equinox's sporty Gold Meets Golden event. Inside the Gold Meets Golden party, Kidman took a moment to embrace Cuba Gooding Jr., who had a phenomenal 2016 playing former football star and suspected murderer OJ Simpson on FX's hit drama. Three music legends were united when Stevie Wonder, Quincy Jones and John Legend shared the stage at The Art of Elysium "Heaven" gala, where Wonder was honored as the 2017 Visionary. Radha Mitchell was eager to try on Revé sunglasses left under guests' seats at the Art of Elysium "Heaven" gala to enhance the culinary journey accords the seven continents designed by chef Michael Voltaggio. James Franco revealed his serious side at the Art of Elysium gala, where he was also featured in a video montage detailing the work the non-profit group does to aid hospitalized youth, special needs education centers, homeless shelters, elder care homes and hospice care facilities. Actress Amber Heard sparkled next Art of Elysium chairman of the board Tim Headington at the 10th annual black tie artistic experience.